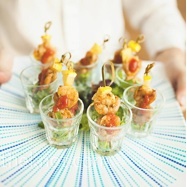 At Relish Catering and Events you can work with our team of designers, chefs and event planners which will manage all of the details of your event. Or we are happy to work with yours. Either way we strive to provide our clients with creative designs and menus tailored to your individual needs. Whether it is an intimate wine tasting dinner or an extravagant gala, Relish Catering and Events professional staff is committed to making your event a success. Our well-prepared staff will thoroughly oversee your event, providing the most friendly, attentive service. At Relish Catering and Events we are attentive to every detail of your event and we pride ourselves on elegant and interesting designs. We create and collaborate with you. The end result will be a one-of-a-kind table filled with exquisite food and individuality. We work seamlessly with our wealth of resources including; floral designers, event décor specialists, linen and rental providers, photographers, entertainers, bar tending services, and more. We will meet with you at your chosen venue and explore your goals and expectations. From there, we will compose your vision into a classic affair, corporate event, or casual celebration. After the planning is done, you can relax and enjoy your event knowing that our team of professionals will execute your event flawlessly.